Thank you for your past support — it is because of you that we were able to accomplish so much last year. And it is because of you that we have been able to unite folks during the legislative session around issues that improve the lives of our neighbors and our communities. These wins are important because, if the past sixteen months have taught us anything, it’s that Democracy is fragile, and Rights can’t be taken for granted. The priorities of far too many elected officials – and the policies they attempt to enact – favor the wealthy few over the benefit of communities they have been entrusted to serve. We need your voice to let our elected officials know we expect them to deliver on behalf of the people of Vermont. And, we need your financial support. 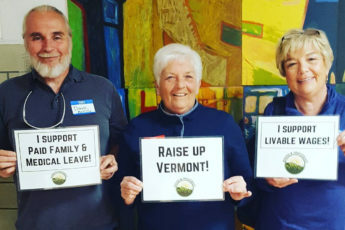 Building on the success of the past two years, Rights & Democracy has fortified its coalitions in order to fight for economic, environmental, health care and racial justice in the Vermont State Legislature. We have mobilized thousands of Vermonters in the the fight to raise the minimum wage to $15 an hour, which recently passed the Vermont Senate and is currently being debated in the House. We have played a key role in the coalition advocating paid family and medical leave insurance, which has passed the House and is now in the Senate. We are actively engaged in the battles for Medicare for All, clean water , energy democracy, and working to end systemic racism in our schools, our government, and our judiciary. We are fostering the next generation of community and elected leaders, through recruitment, education and training through our LEAD-VT program, and providing direct electoral support and endorsements. Throughout rural and urban communities in our state, we see working and middle class neighbors fighting to survive in today’s economy. That’s why this spring we are launching a series of community forums, going into our rural communities, meeting people with diverse backgrounds and political viewpoints in order to better understand their priorities for the future, and develop a platform we can use to hold elected officials accountable to our community’s true needs. You can help with a one-time, annual donation of $25, $50. $100, or more. Or, join our growing list of monthly, sustaining donors who give $5, $10, $20 (and more) each month to help make our shared work possible. We need your help in so many other ways, too. Get involved – forward our emails and Facebook pages to your friends, attend a meeting or a rally, join a working group, attend a legislative committee hearing or testify. We want our elected officials to hear your concerns. One way to get involved is our upcoming MAY DAY RALLY! The all-day event will feature citizen lobby training, a petition delivery to Gov. Phil Scott, and a press conference at the Vermont State House on Tuesday, May 1st, culminating with a 4:30 PM Rally on the State House lawn, State Street, Montpelier. RSVP: Join us to rally in support of human rights & celebrate working class power & unity. Without the support of our members, our shared goals will be difficult to realize. So, it’s imperative that you unite to promote grassroots progressive policies our country so desperately needs. By becoming a sustaining member of Rights & Democracy, you are helping to build that movement — online, in local communities in Vermont and New Hampshire, and beyond. We need your help now to make it a reality.